Fiona Kidman on a ‘split personality’ in London and Paris. In London she lugged her huge suitcase up five flights of stairs and found herself in a bedsit under the eaves of a building that looked elegant from the outside and was a dump inside. There was a fire escape out to the roof just like in The Girls of Slender Means. Only Ellen was forty-five and the war was over. Those days remain with me. I drank German wine and ate imported avocadoes and fish and chips out of paper bundles alone in that room. I was using the bedsit as a base while I researched my novel The Book of Secrets, making journeys to and from Scotland. I was dreaming that some day my work might be discovered further afield than New Zealand, but that seemed improbable because I am a writer who has stubbornly written about New Zealand. Somewhere in my heart I hoped that the reading public might discover New Zealand, the way they ‘discovered’ Australia through its literature in the 1980s. But I still haven’t got to Ebury Street. The publishing house of Aardvark/ Gallic is nestled behind the shop front of Belgravia Books, a compact modern store selling gorgeous books; the shop is owned by the publishers too. Gallic Books was founded by Jane Aitken and Pilar Webb in 2007 with the aim of bringing French fiction to an English-speaking audience. They burst into the publishing scene when they picked up Muriel Barbery’s The Elegance of the Hedgehog, and went on to sell 400,000 copies. Aardvark is an off shoot of that company and publishes writers from around the globe, including New Zealand writers like me, and Tracy Farr, and Damien Wilkins. Tracy’s novel The Hope Fault is due for release next month. My own novel All day at the movies has just come out. All these years later, the world has discovered us. With a staff of five it’s a tiny operation on the surface but it punches way above its weight. I’m here to promote the new release. (Well, let’s be honest, I’ve gone AWOL for five weeks, seeing family and friends along the way, but my publishers both here and in France have picked up on my journey and suggested we work together to get some mileage for the books out of my trip). So first up, it’s a trip to the BBC where I am to be interviewed by Mariella Frostrup for BBC4’s Open Book programme. I’m accompanied by Jimena Gorraez-Connolly, my PR person who has become a firm friend since my first books were released by Aardvark. Jimena is from Mexico, married to an Irishman. I’m not too nervous about the interview because I worked as a radio talks producer for years and more or less know what to do. At least I think I do. But the glamorous entrance and strict security at Broadcasting House rattles me. When I get to the control room, everything is rapid fire. I am quickly ushered into the presence of Mariella. Should I say ‘the Presence’. She sits on the far side of a very large blonde wood table. It is to be a half hour interview, a pre-record but there is not a moment to waste as the next interview will be coming down the line right on the dot of the next half hour. It’s straight into it without the preliminaries, and written questions are being relayed to her from the control room, something I find unnerving. And I’m having trouble with my hearing aids. Well, at least I do know it’s a pre-record and that things can be fixed. I put up my hand and say STOP, this isn’t going very well, and we have a discussion about whether I will use cans or not. When things are more or less sorted we begin again and I do my best. At the end of it, I say firmly, now let’s re-do the first question so that I can come in on a positive note. I can see I’ve upset the apple cart, but we do it anyway and I think Mariella is relieved; its miles better and later people will tell me I sounded confident. Here is some totally unasked for advice, but for what it is worth, if you are doing a pre-record don’t forget that it can be spliced and tidied up and you can ask to correct things. In this digital age these splices are simple and take the operator just seconds. If it’s live, then no matter what you say make sure that the entry into the interview is as forceful as you can make it. The reading in Belgravia Books goes much better that night. It’s a full house and there are a lot of familiar faces, friends whose lives began down under, and a dear grandson who has forsaken New Zealand, and a team of his mates, so there are young people there too. Writers arrive: Kirsty Gunn, Hugh Lauder, Janet Wilson. Later there is a publisher’s dinner and what was meant to be a small occasion grows because nobody wants to go home. We take a room above the restaurant rather than the table that has been booked and the extras offer to pay their way. My publishers get firsthand experience of how a Kiwi party keeps on growing. Later the young people suggest clubbing and invite me along but I know when I’ve had enough of a good thing. My bed at the Grange Strathmore lies in wait. The days of the garret in London are over. All the same, I take another walk past Eccleston Square in the morning. Paris lies ahead, but in between there is the south of France for a week. 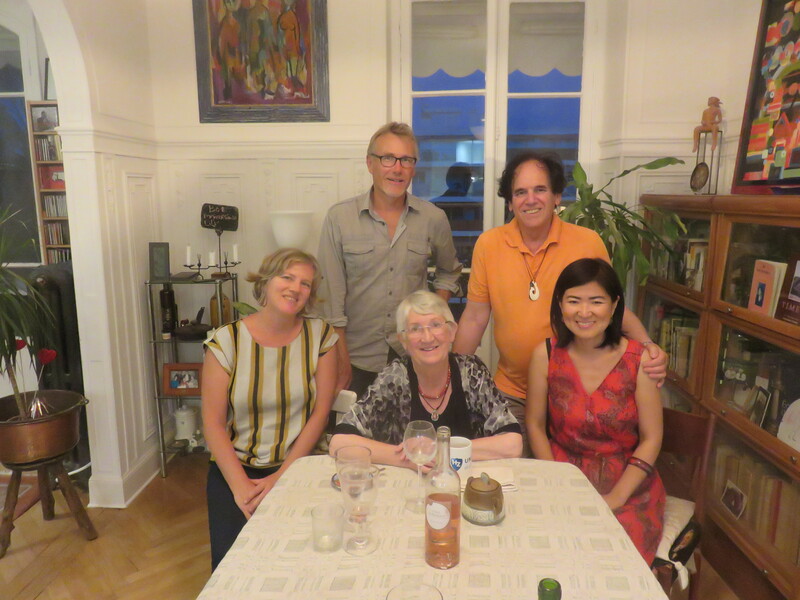 In Nice I spend an evening with Carl Nixon, current Katherine Mansfield Fellow in Menton, and his family, at a dinner hosted by William and Mimosa Rubenstein. William has ‘looked after’ KM Fellows for many years. Rebecca Nixon, Carl Nixon (standing), current Katherine Mansfield Fellow in Menton, William Rubenstein, long time mentor of Katherine Mansfield Fellows, centre seated Fiona Kidman, Mimosa Rubenstein on right. I am beginning to feel like a split personality. I’ve been doing Skype interviews with New Zealand journalists from my hotel bedroom about my forthcoming novel This Mortal Boy, promoting Movies in London, and now I’m about to promote The Infinite Air in Paris. The book has come out recently as Fille de l’Air, translated by the Shakespearean scholar and translator, Dominique Goy-Blanquet, who has just had her own new book out with Bloomsbury. The taxi delivers me to what I thought was the hotel I had booked in St Germain, a place I’ve stayed before. Only it’s not. It’s a building site, a disaster scene. ‘It’s not a hotel,’ I say. The driver says it is and dumps my bags on the street anyway. It is a hotel. It is Hotel l’Odéon, undergoing renovations. The manager comes to the door, his face anxious. The breakfast room will be ready in the morning he tells me. Three burly builders muscle him aside. I put my bags at the reception desk, a table surrounded by tools and machinery, filing cabinets stacked one and top of another behind it. ‘I’m just going out for a walk,’ I say. I set off at a brisk trot to the other hotel, my real beloved hotel beside the Odéon Théâtre. Its name is Hôtel Michelet- Odéon. I feel like a total fool. So much for my clever online booking. When I ask if I might book in for eight nights, the receptionist smiles sadly. They are fully booked. ‘What shall I do?’ I wail with childish frustration. It pulls me up short. Yes, that’s what I must do. In fact, I will get to like the friendly brave staff battling to host their guests at Hotel l’Odeon, and yes, the breakfast room is finished the next day and it’s nice, even if a battalion of tradesmen continue to bang and thump in other parts of the hotel for the rest of my stay. 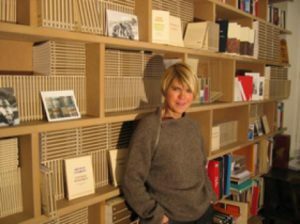 Sabine Wespieser Éditeur with books. 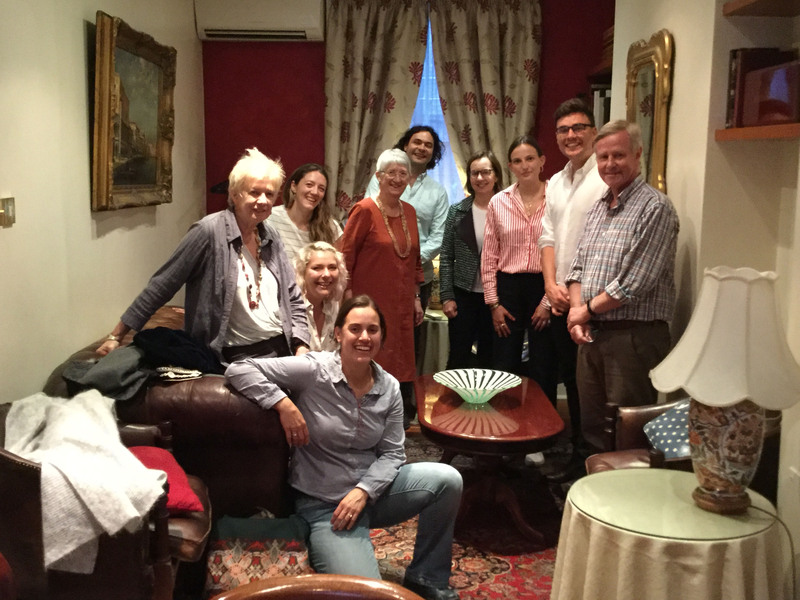 The publisher, Sabine Wespieser Éditeur, is to be found just around the corner in the heart of the Latin Quarter. Sabine’s rooms are situated in a 13th–century building, the steps worn into grooves, the walls thick and heavy, the huge beams of wood above the winding stair low and dark. But, as always, the door opens on rooms that are full of filtered light, and simple, stylish décor. That’s Sabine through and through, the quintessential Frenchwoman. The books lining her walls are all cream. Only the lettering is a different shade and each title she produces has different variations on colour themes. 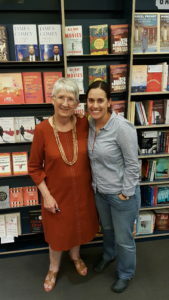 She started her publishing house in 2004 and has produced 170 titles since, from 70 writers. Her modus operandi: she publishes twelve books a year, just that and no more. Each one achieves maximum publicity. The range of her contacts is extraordinary, and nowadays she is a publisher who is written about in her own right. Among her authors she has Edna O’Brien, Tariq Ali and a host of others with illustrious names. Her loyalty to me over twelve years and five books never fails to humble me. This trip is not about talking to media, it’s about talking in Paris bookshops. Sabine cultivates bookshops assiduously and this is a major factor in her sales success. We are going to au Livre écarlate in the 14th, and L’Attrape-cœur, in Montmartre. They are little shops by comparison with New Zealand but crammed with titles and, on the nights that we visit, with people too. And this is the thing that struck me – these shops are not on the high street, nor are they surrounded by other shops. They are tucked away in quiet places but they are a destination for their local communities. In Montmartre, the crowd stretches into the street and clap and cheer when we arrive, waving glasses of champagne in the air. The questions go on for a long time, rapidly translated as we go. On the first night the conversation ran for two hours and they are deep questions exploring every nook and cranny of the characters’ psyches. That night in Montmartre, Sabine takes me up to Sacré–Cœur Basilica to see the lights of the city beneath us. On the way down we get lost in the back streets and go the wrong way down a one-way street; the oncoming driver is aggressive forcing a fast reverse up a winding hill. ‘I think it’s time to go home, Sabine,’ I say. ‘But that is what I am trying to do dear Fiona,’ she says, and suddenly we are laughing until we cry all the way back into the city centre. There is a big dinner at her house the next night, ten of us, a splendid cold zucchini soup to begin with, a fish dish, a cheese course, and clafoutis to follow – it’s the cherry season. Cooking relaxes her, Sabine says. In the wind down of those Paris days there are still friends to see, including former Randell Cottage residents, Pierre Furlan and Thanh-van Tran-Nhut. They both long to come back to New Zealand. I am beginning to, also. Back in London for a few days, my grandsons and I drive down through the Kent countryside to Sissinghurst, and I peer into Vita Sackville-West’ darkened writing room in her tower, and the scent of roses, the roses in the white garden, drift up to meet me. It’s perfect, all perfect. It reminds me that I, too, have a room of my own. Dinner with the Gallic/Aardvark team, and friends. Managing director Jane Aitken is on my right, Jimena sits in front, Maddy Allen behind her. Other friends include Professor Janet Wilson (seated left), Professor Hugh Lauder (standing right). Grandson Tobias Kidman (standing behind me) and his friends make up the rest of the group. 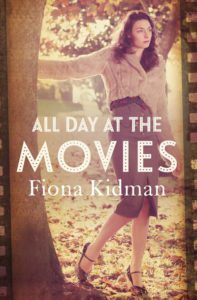 ANZL Fellow Dame Fiona Kidman’s numerous accolades include the New Zealand Order of Merit for services to Literature and the Prime Minister’s Award for Literary Achievement in Fiction. Her most recent novel is This Mortal Boy (Vintage, 2018).